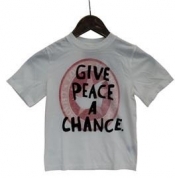 A New York lawyer was arrested Monday night (3/3) and charged with trespassing at an Albany-area mall after he refused to remove a t-shirt with the slogan "Give Peace A Chance" that he had bought earlier that evening. Stephen Downs was sitting with his son in the food court of the Crossgates Mall in upstate Guilderland when he was approached by two security guards who directed him to either remove the shirt or leave the mall. When Downs refused to comply, the rent-a-cops called the local cops, who hauled Downs away in handcuffs.